Move over Alabama, Clemson is the new King of College Football. In our new magazine “Little Ole Clemson”: The Best “Little” Dynasty Ever, we examine not just the 2018 team’s run to being “the best ever” but examine the last four seasons and how Dabo Swinney turned Clemson into the new dynasty of college football. We also take a look at the role former athletic director Terry Don Phillips played. We go behind the scenes at the Tigers’ run to a second national championship in three seasons and the previous three national championship runs. The Clemson Tigers are on the hunt for another national championship and expectations couldn’t be higher. Back with a Vengeance takes an inside look at the upcoming 2018 season. The Clemson Tigers are the national champs and have been to back-to-back championship games, but the best is yet to come. ‘Best is the Standard’ takes an inside look at the upcoming 2017 season. The Clemson Tigers are national champs!!! Hot off the press! 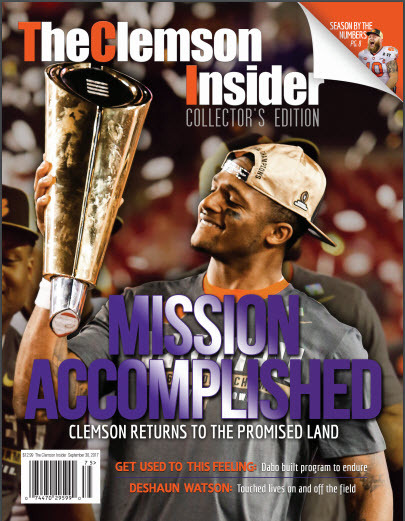 Get you copy of this special collector’s edition on Clemson’s championship season. Clemson’s No. 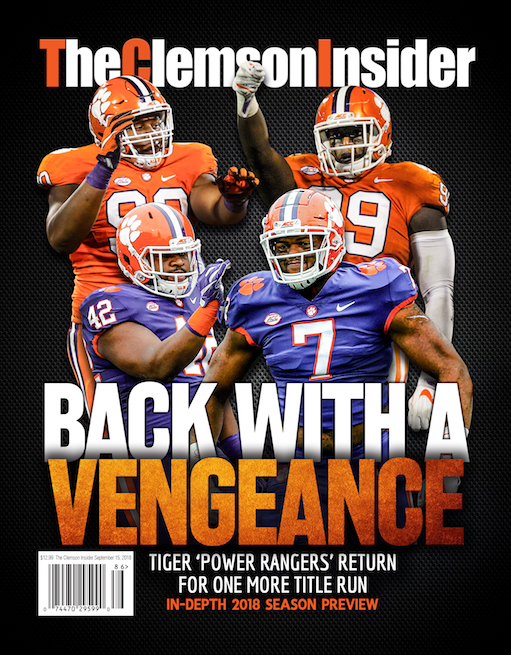 1 magazine from the staff that covers Clemson football 365 days a year. 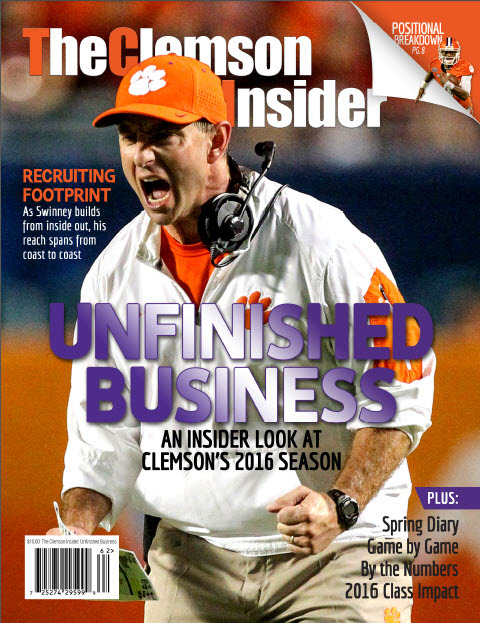 Unfinished Business – An Insider Look at Clemson’s 2016 Season! Clemson’s No. 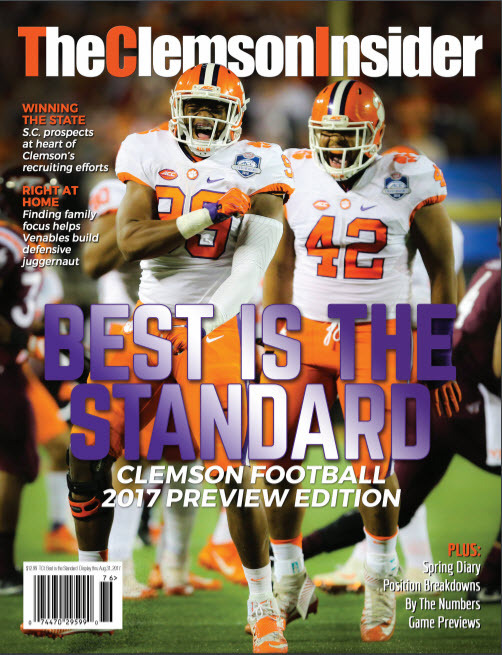 1 preseason magazine from the staff that covers Clemson football 365 days a year. How coach Dabo Swinney has changed the recruiting footprint for the Tigers, how will the 2016 class make an immediate impact, in-depth position analysis, spring diary, game by game analysis and much more! 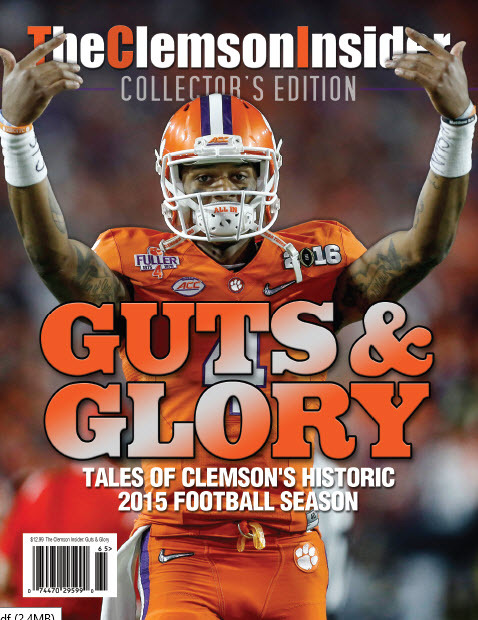 If you haven’t purchased Guts & Glory – Tales of Clemson’s Historic 2015 season get your copy today while they are still available.